Interest in using virtual private networks, or VPN, when browsing the internet is now surging. On March 28, the United States Congress voted and approved to repeal restrictions which stop internet service providers from selling personal browsing data and information. 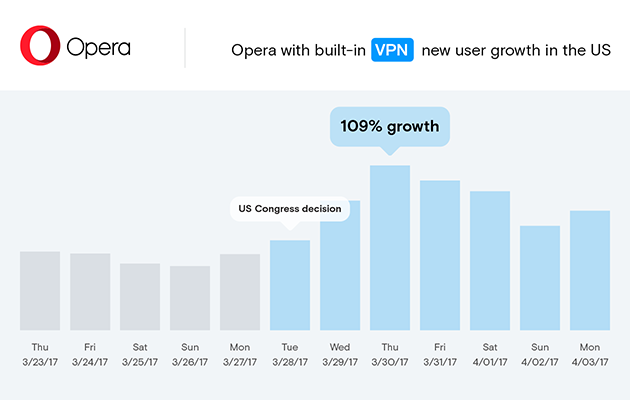 Since then, the number of new U.S. users of Opera, the only browser with a free, built-in VPN, has doubled in just a few days. For the Opera browser, the growth in downloads has seen an identical boost. The average number of daily, new Opera users in the U.S. has more than doubled since Congress decided to repeal certain internet privacy protections last Tuesday.